In The Evolution of the Lecture I posed the question, “could we live without lectures?” and while far from the first to do so, I suggested that lectures need to evolve in our modern world. Clearly technology can enhance education, but how should it be incorporated? And, what tools are out there? Technological teaching tools and materials are advancing so quickly that it’s impossible to give a comprehensive list or try to use all of them in a course, but I will present a few that have proven very useful to me and many seasoned educators. Make your presentation slides come alive! Powerpoint slides are usually quite dull; these days, don’t you want interactive math, animations, graphs, and visualizations in lectures? Mathematica makes this incredibly easy. Mathematica is like a super-graphing-calculator for your computer, but it can also be used for presentations. 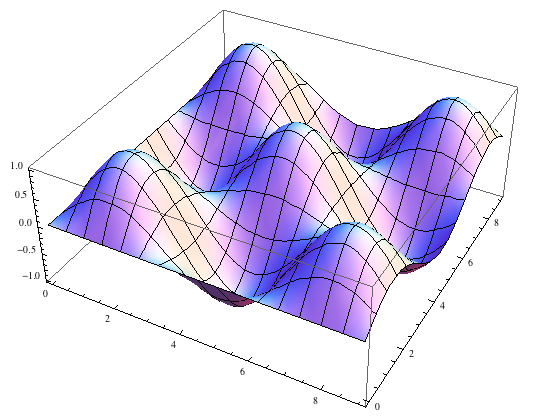 For example, if you’re writing a lecture, instead of introducing a function such as Sin(x)Sin(y), you can use one simple command, “Plot3D,” to make it appear as an ocean of waves (below). Then you can use another command, “Animate,” to make that ocean move and flow! Next time you are presenting something involving math, statistics, or plots, before choosing a static presentation, try using Mathematica. Then when someone asks you a question you can even do the math and visualizations inside the lecture slide. Never answer the same question twice! Piazza is a new tool that helps take your students’ questions and your answers (as well as answers from their peers) online. Students can use this online tool to ask their question to the entire class (students and teachers) with the option of anonymity, and anyone can reply. This way students and teachers can learn from answers to inquiries anyone in the course has posed. So, the next time you find yourself answering the same question twice, or want help answering questions from students in the class, check out Piazza.com. Many tools are now being developed, and since each class could be enhanced by different technologies, teachers should think carefully about which are best suited for their courses. If they do, I am optimistic that the extinction of boring lectures is nigh. good info. It can be difficult to get the older generation of educators to embrace new technologies. These people are mostly not willing to change their teaching method after using it for so many years. brain needs to be stimulated win with pictures, songs and writings. It’s an remarkable post in favor of all the online people; they will get advantage from it I am sure. Thank you so much for this article. I am about to give workshops again (after a three year break) and the things you write about are very helpful. It’s a good thing, change is education is necessarily (hope that is spelled right, coming from Holland ;-).